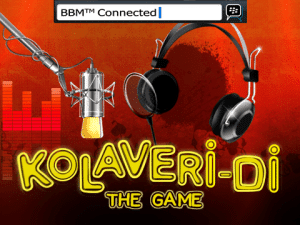 Kolaveri Di – The Game, is now Official on Blackberry devices. Kolaveri Di – The Game is inspired by the Indian song “Why this Kolaveri Di” which is written and sung by Dhanush, and composed by music director Anirudh. The app records your voice on the Kolaveri Di tune. It also enables the user to send the recorded track via Blackberry Messenger (BBM). It has 5 different game modes to record their own vocals in Kolaveri Di tune right from their Blackberry smartphone. Also, this app will feature two different karaoke tracks. The app is available at Blackberry app world Free of cost. Grab it soon to get the Kolaveri Effect. Do let us know how many tracks you recorded with Kolaveri effect via comments below.